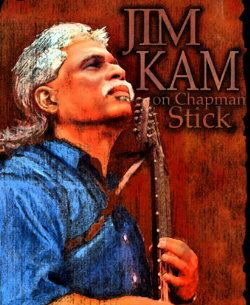 While we’ve had a couple of Chapman stick players appear on members’ albums before, this is the first MTM member who’s primary instrument on the album is the ‘stick.’ Welcome Jim Kam of Houston as he offers “JIMMY NOBODY,” a five-cut EP worthy of every accolade available. If you haven’t familiarized yourself with this fabulous instrument invented in 1970 by Emmett Chapman, now is a good time. Not only is it a beautiful instrument for lyric-less music such as on Kam’s “Daydream,” but it is a fabulous instrument for accompanying the voice, and Kam has a great one. Jim Kam pens two of the five tracks, covering two, and the fifth being the traditional “She Moved Through The Fair.” I’m leaving this disc in my player. You need it for yours, so get it today for only $7.99! You will receive an .html file with download instructions. Email us if you need assistance with smartphone downloads.